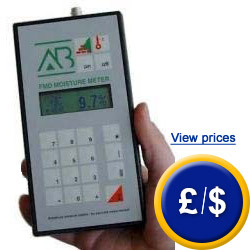 The FMD humidity detector for paper functions with a microprocessor. This humidity detector is used to determine absolute humidity of both paper and building materials. The FMD humidity detector has an electrode which can be inserted into or placed on the material to be measured. The FMD humidity detector corrects real percentages of humidity values according to the pre-selected material and the temperature (absolute humidity). The calibration curves for many different paper types that can be found in the humidity detector are unique. Users will be able to program ten additional calibration curves in the humidity detector memory. The FMD humidity detector has a storage capacity of 75 protocols with 1000 different measuring values. Each protocol includes some indications about the material and a statistic summary containing the reliability range (clock with time and date). With the help of the software, stored data can be transferred to a computer for later revisions. The FMD humidity detector can be connected to an external temperature sensor to perform corrections of temperature and to determine the moisture content of paper. The FMD is designed for professionals in order to perform quality controls of humidity in different types of wood, paper and building materials to store them for later valuations in the computer. - Automatic temperature correction connected to a temperature sensor. With the FMD humidity detector of paper it is possible to determine the real moisture content with high accuracy by introducing the corresponding characteristic value of every material (for the characteristic curve of the stored material) in the detector. Charts with more than 500 characteristic values for wood, building materials and paper will be included in the delivery. Attention: All the characteristic curves of the different materials of this column and the adjoining one are stored inside the humidity detector FMD. They can be displayed by introducing the corresponding gross densities. A chart with all the materials and wood types will be included in the delivery. You can program the meter to cover all your needs, especially the ones related to manufactures of papers with specific hygroscopic characteristic. The measuring values will be higher in chips or knots. On the contrary, if measurements are taken on breaks, the humidity value will be lower in relation to the real humidity value (absolute humidity). The software for FMD humidity detector of paper is included in the delivery. It is a professional software for programming the device and for analysing data on a computer. It also allows the user to adjust the device parameters via computer. Data can be exported to other programmes such as MS Excel by means of a data cable included in the delivery. Users will have to establish a communication port from the computer to the detector. Once this communication port is adjusted, you can use this program without any problems. This program is developed for Microsoft Windows 95, 98, 2000 and ME. It can work with any standard printer. Files can be stored in network stations or shared working stations. 0 ... 99 % H2O for building materials. Statistics functions mean, maximum and minimum value, standard deviation and reliability level. 1 x FMD humidity detector for paper, 1 x software, 1 x data cable, 3 x batteries, 1 x housing, user manual and instructions to measure humidity. It is hooked up with both plugs to the universal probe holder/Humidity is measured in the black measuring surface/This contact sensor works without causing any damages in the material/It is specially suited for measuring humidity on printed wall-papers, plastics, valuable woods and other building materials where it is important to measure without causing any damage. It is hooked up with both plugs to the universal probe holder/Humidity is measured by ends of the two pins/It is specially suited for great diameter woods, beams, timber planks as well as for diverse insulation materials and fibre or for light building foam materials such as foams. To accurately measure humidity in diverse concrete depths.